Our flock is located just south of the community of Overbrook, KS. We got our start with sheep in 2004 when our neighbors got us hooked on the idea. It seemed like a great activity for kids so we decided to give 4-H a try. From there our flock has continued to grow. Our girls have always been most interested in the dorset breed. That's where the focus of our breeding is. In 2007 we were proud to use a dorset ram born and raised at our farm ("Thunder") for breeding. Later that same year the opportunity to sell him presented itself so we did. Then we purchased a dorset ram from Jeff Ebert. 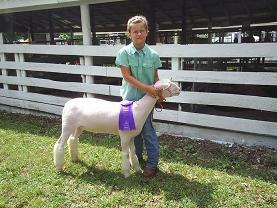 He is the dorset ram ("Psycho") used for all of our dorsets this year. 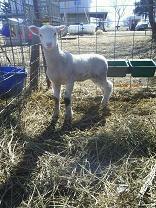 We also leased Psycho out to two 4-H'ers for the breeding of their ewes. Psycho's offspring have been really powerful! We are pleased with the results. Our goal is to breed, raise, and show our own dorsets...while hopefully also turning other folks on to this wonderful breed of sheep. If you are looking for a quality dorset at a fair price, we would love to be your dorset connection! Good luck to everyone during the 2008 show season! You are the person to visit our farm!